With the clock ticking down for the start of the next World Series of Poker (WSOP), we look at which online poker sites are offering the best WSOP 2019 satellites. This year, the World Series of Poker will be one of the biggest yet. Running from Wednesday 29th May to Tuesday 16th July, the Series will consist of at least seventy-three live bracelet events, several online bracelet events, and daily non-bracelet tournaments with low buy-ins that have been scheduled in order to give visitors to WSOP 2019 more opportunities to get involved. As usual the highlight of this year´s World Series of Poker is the WSOP Main Event 2019. The first opening Flight A of the event takes place on Wednesday 3rd July, with Flights B and C scheduled for Thursday and Friday. As in recent years, the survivors from Flights A and B will play their Day 2s on Saturday 6th July, while survivors from Flight C taking up battle on Sunday 7th July. Late registration will be open this year until the start of the two Day 2s, although there will be no re-entries allowed. In other changes to the WSOP Main Event 2019 structure, players will start with 60,000 chips instead of 50,000 chips, and – once the ante levels are reached – the tournament will have a Big Blind Ante format to speed up action at the tables. Players should be in the money by the end of Day 3. 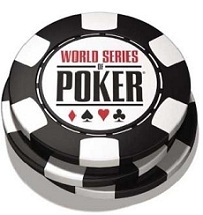 Due to the WSOP Main Event having a direct buy-in of $10,000, several online poker sites are hosting WSOP 2019 satellites that give players the opportunity to win a seat in the multi-million dollar tournament – or at least win sufficient cash to pay for their seat with a little left over. Here´s a quick run-down of how you can qualify for the WSOP 2019 Main Event for just pennies on the dollar (ALMOST for free). 888Poker is running a Steps promotion with multiple buy-in levels starting at $0.01. Players who climb the Steps will be rewarded with a seat in a weekly Road to Vegas WSOP Main Event qualifier in which the winner will receive a seat in the Main Event plus an accommodation package and a contribution towards their travel expenses. Americas Cardroom is also hosting a WSOP Steps promotion with multiple entry points starting at $0.28. The difference in this promotion is that there is only a single final step on 9th June which will award the top fifteen players with cash prizes of $12,500 – sufficient for the Main Event buy-in, accommodation, and travel. Black Chip Poker is running an identical promotion to Americas Cardroom, giving existing ACR players who are interested in satellites for the WSOP the opportunity to create an account with Black Chip Poker and take advantage of a second welcome bonus. Both sites operate on the Winning Poker Network, so the range of other opportunities will also be identical. The 2019 WSOP will be special in many ways. Due to it being the fiftieth running of the World Series of Poker, the first big weekend event of WSOP 2019 will be a “Big 50” NL Hold´em tournament with a modest rake-free $500 buy-in and a guaranteed prize pool of $5 million. Other commemorative events will run throughout WSOP 2019, including a celebratory gala and awards evening on Saturday 29th June. Other tournaments forecast to be popular include the Millionaire Maker (starts Friday 7th June), the Monster Stack event (Friday 21st June), the Colossus (Wednesday 26th June), and the Crazy Eights event (Friday 28th June). For the first time ever there will be a Short Deck 6+ NL Hold´em tournament, plus the WSOP will host a special event on Wednesday 10th July open only to previous bracelet winners. The Main Event is not the only WSOP tournament players can satellite into via an online qualifier. In addition to WSOP 2019 satellites for the Main Event, 888Poker is running online satellites for the Crazy Eights event that include the $888 buy-in, accommodation and a contribution towards travel expenses. You can use the Steps promotion to win a seat in the weekly satellite, or fast track via sub-satellites. Due to the Crazy Eights tournament having a much lower direct buy-in than the Main Event, the weekly satellite for the Crazy Eights event has a direct buy-in of just $109 (compared to the Main Event WSOP 2019 satellite that has a direct buy-in of $1,050). The Steps level prior to the $109 level has a buy-in of $30, but you can also win $109 tournament tickets via scheduled sub-satellites with just a $5 buy-in. Elsewhere, other online poker sites have been slow to announce their WSOP satellites. It´s not unusual for this to happen due to seasonal promotions taking priority, and the easiest way to find out when new opportunities are announced is to follow @PokerNewsReport on Twitter. Whatever route you choose to take, good luck in the WSOP satellites. In 1970, the first ever World Series of Poker consisted of a series of cash games played at the Horseshoe Casino in Las Vegas between seven invited players. The winner – Johnny Moss – was determined by a vote among the players, but Moss proved he was no one trick pony by taking the title the following year when the WSOP “Main Event” took the format of a NL Hold´em freezeout tournament. The popularity of the World Series of Poker grew in subsequent years, but not to the level it is at now. Prior to online poker sites offering WSOP satellites, the biggest fields competing in the Series consisted of little more than a few hundred players. It was only when Chris Moneymaker won the WSOP Main Event in 2003 the event caught the imagination of online players and fields first exceeded 1,000 players. Since then the WSOP Main Event has expanded to be the biggest live poker event in the world and attracts more than six thousand entries per year. Typically the winner will walk away from the Final Table more than $8 million richer – a far cry from the $30,000 won by Johnny Moss in 1971. Will it be your turn this year? You will have a better chance if you play in the WSOP satellites.